Add a memorable twist to your wedding or special event! Whether you are hosting a party, fundraiser or other occasion, there are so many exciting decisions and plans to make. You have chosen the date, the place, the attire, the dÃ©cor, the color palette -- now, you are left with what to choose as favors for your guests to take home. Imagine serving your drinks with neoprene koozies, arranging a favor display to show off a logo or accompanying your table settings with a personalized memento that will last far beyond the day of your special event. Our custom koozies are the perfect gift and a great opportunity to show off your personality and spirit. Our website has been geared toward making the process of ordering, designing and completing your custom koozies easy. Plus, we offer customized koozies at a great bargain. Share your love of the beach or country music -- a favorite photo or a simple graphic to match the theme of your occasion. Maybe you and your co-host are from different colleges or states with rivaling sports teams. Your unique interests are great themes to expand on! Our custom koozies allow many color choices for numerous combinations and themes, as well as full color imprint for a more flamboyant presentation. Show off your personality, interests, a special moment, or something that will make your friends and family feel like they are included in your thoughts on this special day. You can use your imagination or go with one of the designs in our clip art gallery; then add your own text to customize your party favors. If youâ€™re stumped? We can help! Just request something from our talented artists that will suit your ideas or theme and see what will work for you. Our custom koozies take the work out of your busy schedule by making your party favors easy to design and fully accessible. No more going from website to website with your busy schedule! It couldnâ€™t be easier to pick your colors, choose your design, decide on a personal saying, and make a completely customized product all in front of your personal computer at home. We are here to help with any of your design questions or concerns. Not only will custom koozies be the easiest task on your list, but the most fun and, ultimately, the perfect way to end the afternoon or night. 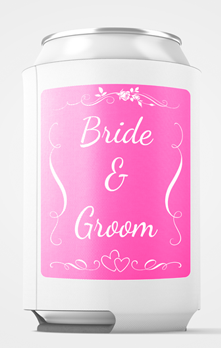 Custom koozies for a wedding also can be a great choice for your bachelorette party, engagement or anniversary celebration. 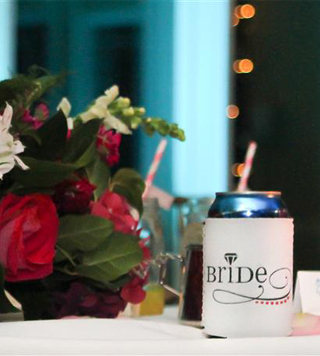 Our inexpensive koozies lend a personalized touch to a memorable day. Do you have a special saying or quip that defines your event? Let your imagination run wild and create something special that will have meaning for years to come, keeping the memories fresh and alive. We pride ourselves on our customer satisfaction and our personal commitment to making your ideas a reality with our quality products. What are you waiting for? Your custom koozies might be the easiest and most economical purchase you will ever make. Weâ€™re happy to answer your questions! Copyright Â© 2017 KooziesOnline.com. All Rights Reserved. KOOZIEÂ® is a registered trademark of BIC Corporation and use herein is by permission.